What a pleasant little piece of plug-and-play. Putting the Fiat 500c’s retractable roof on the hot 500 Abarth was pretty much a no-brainer, and hey, we certainly aren’t complaining. Folding the soft top back on the little hatchback will only allow us to better hear that awesome exhaust note while we’re burying the throttle. And come on, who doesn’t like a little wind-in-your-hair action? Again, the 500c Abarth package is pretty much a copy/paste job, so dynamically, the car isn’t all that different. Under the hood is the same 1.4-liter MultiAir turbocharged inline-four, good for 160 horsepower and up to 170 pound-feet of torque (assuming you pressed the Sport button on the dash – something you really, really ought to do). A five-speed manual transmission is the only ‘box available. And don’t you dare complain about that. New enhancements for the 2013 500c Abarth include an available Beats Audio system, and buyers will be able to attend a no-cost Abarth Driving Experience, where professional racers will show customers how to make the best use of their cars under full-throttle track applications. Pricing hasn’t been announced just yet, but we expect to have that closer to the car’s on sale date early next year. Hit the jump for the full deets, and check out the scorpion-stung cabriolet in our attached galleries. 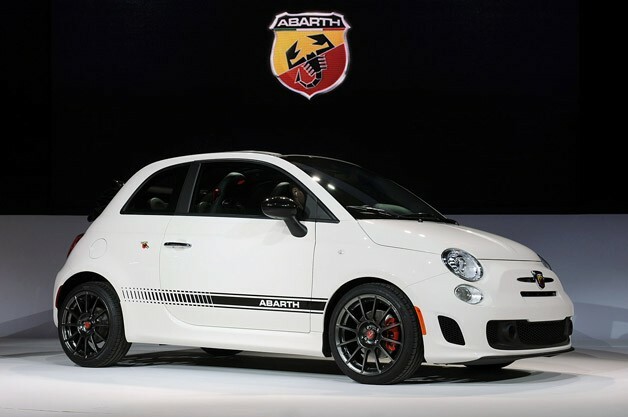 2013 Fiat 500c Abarth takes its top off with a quickness originally appeared on Autoblog on Wed, 28 Nov 2012 19:01:00 EST. Please see our terms for use of feeds. Fiat is taking the lead from Mini and expanding its lineup of mini-me runabouts. The Italian automaker has done the 500 every which way, including convertible and performance models and now even electrified versions. 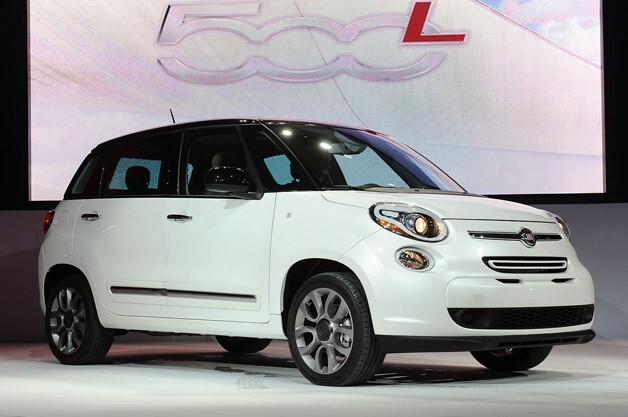 Following this expansion comes the first actual growth in size; the 2014 Fiat 500L. First shown at the 2012 Geneva Motor Show in March, the 500L features 42 percent more interior space through lengthening the 500 platform by 26 inches. With that added size comes added power, specifically the 1.4-liter MutliAir inline four cylinder engine. Also found in the Fiat 500 Abarth and Dodge Dart, the turbocharged four-pot makes 160 horsepower and 184 pound-feet of torque. Power is sent to the front wheels through either a six-speed-manual transmission or a dual-clutch gearbox. From what we can see, the 500L has a more refined and advanced interior than its smaller Italian stablemates. Most notable is the availability of the Uconnect 5.0 (and available 6.5) system, featuring audio and navigation controls, among other functions. The four-door Fiat 500L is set to arrive at dealer showrooms mid-2013, and will be produced in Fiat’s Kragujevac, Siberia plant… so you know the heat will work! To learn more about the 500L and its utilitarian predecessors such as the Fiat Panda and Multipla, check out the press release below. 2014 Fiat 500L adds size, refinement and toys to 500 lineup originally appeared on Autoblog on Wed, 28 Nov 2012 20:00:00 EST. Please see our terms for use of feeds. Didn’t think it was possible to pull and pry at the diminutive Fiat 500 with enough gumption to make the Italian hatchback qualify as a large car (according to the EPA, at least)? Witness the Fiat 500L Trekking, seen above. It’s a full 26-inches longer than the regular 500, and it’s grown six-inches taller and wider. All that stretching means there is 42 percent more interior room in the 500L than the standard car, which means it’s a good thing the only engine available is Fiat’s 1.4-liter MultiAir turbo four-cylinder engine, as seen in the Abarth, with 160-horsepower and 184 pound-feet of torque. A manual gearbox is standard, and a dual-clutch automatic is optional, each with six gears. The Trekking model features unique front and rear fascias and 17-inch alloy wheels to set it apart from the base 500L, and the black wheel arch and body-side sill moldings make it look more aggressive. Want to know more? Check out the high-res gallery above and scroll down below for the press release. 2014 Fiat 500L Trekking takes the hatchback into the big leagues originally appeared on Autoblog on Wed, 28 Nov 2012 20:10:00 EST. Please see our terms for use of feeds. 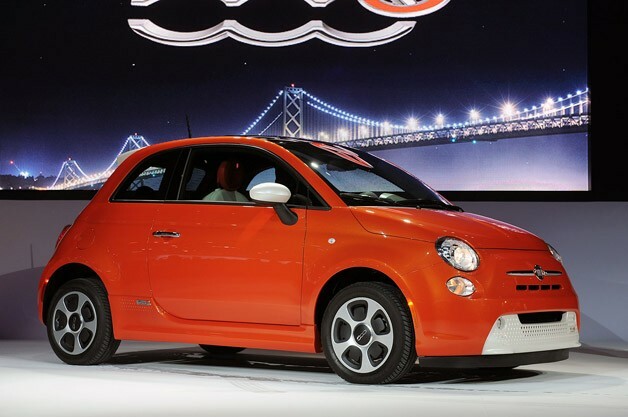 Somebody wanted it, so we all got it – the Fiat 500e, the electric city car packed with enough Earth-saving tech that CEO Sergio Marchionne quipped (admittedly, early last year) that each one built will cost Fiat $10,000. The good news is that it not only comes with tons of EV-only gadgets and features, it does a good job, to our eye, of flaunting its electric looks and it offers the kinds of personalization one would expect of a hatch in the 500 family. The multi-contrast exterior is grouped into three color packages, including an e-Sport Package that pairs mean with green. The Interior can be had in either Nero or Steam, both coming with Electric Orange accents, and a seven-inch TFT screen with all kinds of electric-car-status details. Juice comes courtesy of a 111-horsepower electric-drive motor with 147 pound-feet of torque, using a battery rated at 24 kWh. Range is estimated at “more than 80 miles” on the 15-inch Firehawk GT low-rolling resistance tires, but Fiat says stories of “greater than 100 miles” aren’t uncommon. With our high-res gallery above, you don’t have to go that far to check it out from every angle. 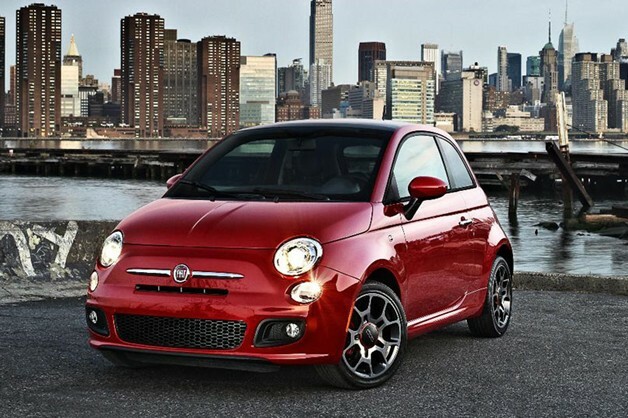 2013 Fiat 500e looks loud, runs quietly originally appeared on Autoblog on Wed, 28 Nov 2012 20:40:00 EST. Please see our terms for use of feeds. 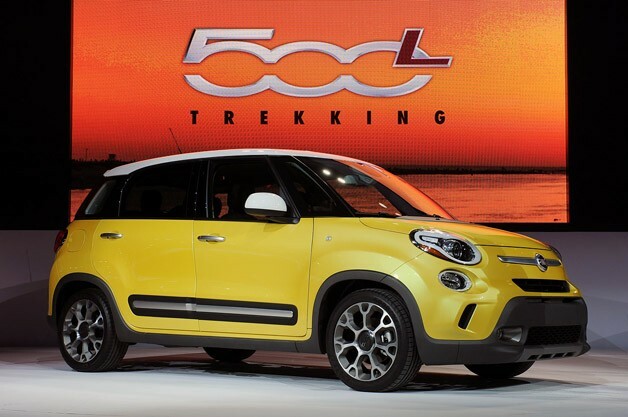 Fiat has pulled back the curtain on the North American 500L ahead of the five-door’s debut at the 2012 LA Auto Show. Engineers have drawn and quartered the base 500 to create a machine that’s a full 26-inches longer and six-inches taller and wider. The result is a crossover with 42-percent more interior room than its tiny three-door counterpart. Power comes from a version of the same turbocharged 1.4-liter MultiAir turbo four-cylinder engine that powers the 500 Abarth and Dodge Dart. The 160-horsepower mill is paired to the buyer’s choice of either a six-speed manual or dual-clutch transmission, and offers 184 pound-feet of torque. 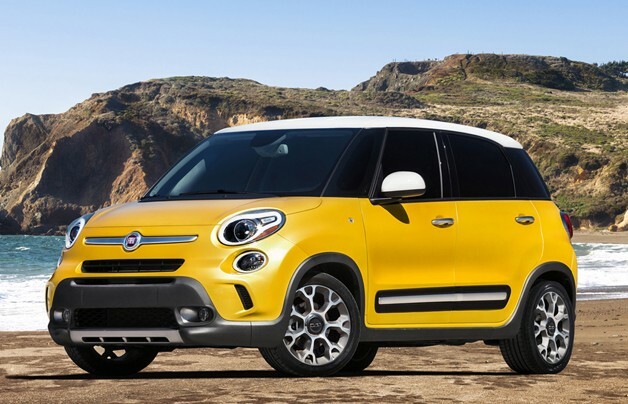 The 2014 Fiat 500L will come in standard and Trekking configurations, with Trekking models like the one above offering differentiated front and rear fascias as well as a two-tone interior, bulging fender arches and standard 17-inch alloy wheels. Designers also graced the trim with black exterior accents for a more aggressive look. Inside, the 500L will offer Chrysler’s Uconnect 5.0 infotainment interface as standard equipment, though Trekking models can be had with the 6.5 system and its larger touchscreen audio. Expect to see both trims show up in Fiat dealers toward the middle of next year. Until then, check out the full press release below. 2014 Fiat 500L rounds out the model range originally appeared on Autoblog on Wed, 28 Nov 2012 00:07:00 EST. Please see our terms for use of feeds. 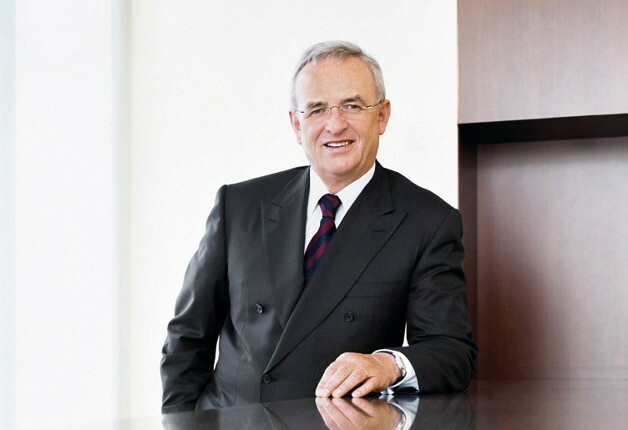 Industry Leader of the Year and CEO, Europe – Martin Winterkorn, CEO, Volkswagen Group (above): The VW boss started with the German automaker in 2007, overseeing a staggering 12 brands. Under his leadership, sales of Volkswagens have gained in both China and America. VW has also expanded production to America and grown its operations in Brazil. Winterkorn is a very hands-on executive, traveling to America six times to test and tweak the American-built current-generation Passat. Volkswagen is aiming to be the largest and most profitable automaker in the wold by 2018, and Winterkorn will stay on through that time, making him accountable for those goals. CEO, North America – Sergio Marchionne, CEO, Chrysler Group: How does 31 straight months of positive year-over-year sales sound? The Fiat and Chrysler chief has bestowed dealers with a wealth of new product, and the American automaker is expected to post $1.5 billion in profits this year, in spite of economic turmoil in Europe. CEO, Asia – Takanobu Ito, President, Honda Motor Co.: In addition to leading the Japanese automaker through the aftermath and destruction of a tsunami, Takanobu Ito has overseen the revival of the NSX sportscar and the emergency facelift of the Honda Civic. He has also stated the company is looking to grow to six million in global sales in the next four years. Big plans, but he has also delivered up to this point. US Exec, Asian Automaker – Jim Lentz, CEO Toyota Motor Sales USA: Lentz has endured as Toyota’s US boss through the 2010 unintended acceleration issue, and the 2011 Japanese earthquake and tsunami. Through all of this, the Toyota Camry is still America’s best-selling car, and profits are on the rise. Success in the face of crisis, indeed. US Exec, European Automaker – Jonathan Browning, CEO, Volkswagen Group of America: The 53-year-old Englishman came over to head up Volkswagen of America two years ago. Since then, VW sales have increased here at a rapid pace, and the brand has opened the Chattanooga plant to build the Passat. The plant is expected to expand to produce a mid-sized crossover (Tiguan perhaps?) for the US market. To see the rest of the AN All-Stars, as well as previous year’s winners, click through to the link below. Automotive News names its industry All-Stars originally appeared on Autoblog on Wed, 28 Nov 2012 11:29:00 EST. Please see our terms for use of feeds. Shares of Chrysler parent company Fiat SpA fell by 5.9 percent on Tuesday. Two European banks downgraded the company’s stock, with UBS AG dropping the company’s stock from a “buy” rating to “neutral.” Likewise, Deutsche Bank cut the company’s shares from “hold” to “sell” amid concerns that the company will need a new cash infusion to fund CEO Sergio Marchionne’s plans for the automaker. Marchionne has made it clear he plans to purchase the remainder of Chrysler, which will require Fiat to raise somewhere between 1.6 billion and 2.9 billion euros. That’s due in part to the fact that the company may have to start paying fair-market value for Chrysler stock as the company’s initial public offer grows near. Bloomberg reports Marchionne is keen to increase the Fiat stake in Chrysler in order to access the profitable North American manufacturer’s cash flow. 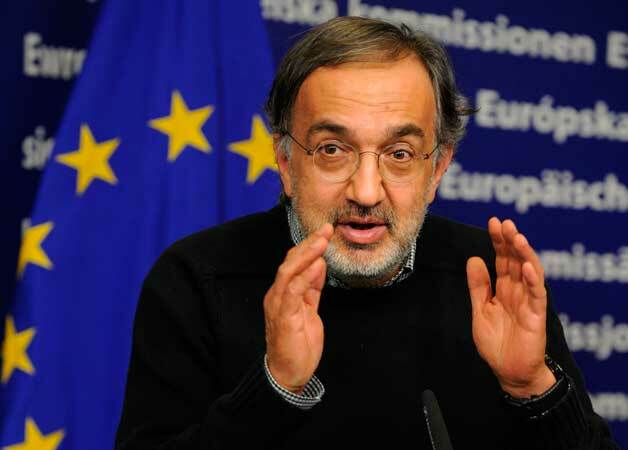 Fiat could then use those funds to jump start its ailing European operations, though Marchionne has been quoted as saying Fiat doesn’t need Chrysler’s cash to bring its EU business in line. Last quarter, Fiat reported 20 billion euros of available liquidity, down from 22.7 billion euros at the end of June. European banks downgrade Fiat, share prices tumble originally appeared on Autoblog on Fri, 23 Nov 2012 09:56:00 EST. Please see our terms for use of feeds. Fiat has constructed 1 million new 500 models. The company says that the milestone model rolled off the line at the manufacturer’s Fiat Auto Poland facility. The one millionth 500 is a Lounge model with optional three-layer Bianco Perla exterior paint. While the quirky little European runabout touched down on US shores for the 2011 model year, the hatchback has been on sale in the EU since 2007. In fact, Fiat sells the compact in more than 100 countries. While the North American model features a few aesthetic differences, including a revised front fascia, the car retains much of its European flair. North American buyers have responded by dragging home a full 70,000 units since the model debut on our side of the globe. Each of those vehicles were manufactured at the Fiat plant in Toluca, Mexico. You can check out the brief press release below for more information on the Fiat 500 and the company’s production achievement. Fiat builds one-millionth 500 originally appeared on Autoblog on Wed, 21 Nov 2012 18:46:00 EST. Please see our terms for use of feeds. Copyright © 2019 Chrysler 300 Tacoma. All Rights Reserved.